I have now published the report of my investigation into Co-operative Group Limited and this edition of News from the Adjudicator provides a summary of my findings and next steps. I found the retailer had breached the Groceries Supply Code of Practice on two counts. It failed to give suppliers reasonable notice of decisions to de-list products and also varied supply agreements unilaterally and without reasonable notice in applying certain charges. The practices and behaviours described in my report were widespread. Systems, processes, business practices and the ability of different parts of the retailer to affect suppliers’ risks and costs of trading with it all contributed to Co-op breaking the Code. Co-op must urgently implement five robust recommendations I have made to respond to the weaknesses I found and to embed a very different approach to Code compliance. At the core of the issues there was clearly inadequate governance to oversee and manage Code compliance and as a result I have said Co-op must remedy this and give its legal, compliance and audit functions sufficient co-ordinated oversight to ensure it is complying with the Code. In addition, all employees who make decisions which affect a supplier’s commercial arrangements with it should be adequately trained in the Code and whenever there is a possible de-listing Co-op must communicate with affected suppliers to enable the retailer to decide what is a significant reduction in volume and reasonable notice. You can read my full report here. I have given Co-op four weeks to provide me with its plan for implementing these recommendations and I will be helping the retailer to change its approach by monitoring closely how it introduces the necessary changes. I expect this work to take between six and twelve months and to show major benefit for suppliers. Ultimately, I launched this investigation to help Co-op to get things right for the future. This was an important investigation because it firmly establishes the role of governance and corporate culture in ensuring Code compliance. Although the recommendations are for Co-op my interpretation of the key paragraphs of the Code and related ways of working to ensure Code compliance will apply to all the regulated retailers and I will be talking to them about what this will mean for them. There is also a lesson for suppliers about the importance of speaking up to me or telling a retailer when it is taking action that could be breaching the Code. Co-op mistakenly assumed that its brand values and desire to work in a certain way meant that it was likely to be acting in accordance with the Code and that if there were any issues with compliance, suppliers would have made the retailer aware of them. The investigation was a very detailed piece of work and I was able to see and analyse a great deal of information. I also met a wide range of suppliers, both branded and own label, to discuss their relationships with the retailer. I am very grateful to those who took part and I recognise the effort it required to prepare the evidence I requested. As with my earlier investigation into Tesco I have been able to produce my report and recommendations without any supplier being identified. Confidentiality has been safeguarded at all stages. There is now an opportunity for all suppliers to tell me about their experiences with all the regulated retailers. My sixth annual survey is currently underway and open until 23 April. You can respond to it at www.yougov.com/gca. Please take the time to complete it because it helps shape my work for the coming 12 months as well as alert me to any emerging issues and developments. The more responses I receive, the deeper I can delve into the issues affecting the sector and particular areas of the sector. Your views are very important so please be frank and open when you complete the survey and encourage your fellow suppliers to do the same. This year it includes the two additional retailers designated by the Competition and Markets Authority – Ocado and B&M. YouGov carries out the survey on my behalf and everything you tell me is treated in strict confidence. YouGov collates and analyses the answers and respondents are not identified to me without having given their consent. The results are reported at my annual conference; do register now to attend this on 24 June as it is valuable for learning about the latest developments relating to the Code – including the learning points from the Co-op investigation – and my plans for the year ahead. Following publication of a revised best practice statement on forecasting and promotions, the GCA asked the ten original designated retailers to report in March on what steps they have taken or are taking to bring their practices into line with that statement. The GCA has received the retailers’ responses and is currently analysing them. At the same time she is listening to supplier feedback and will take into account the results of the annual survey before deciding on next steps. Delay in payments remained the number one issue reported in the last annual survey. 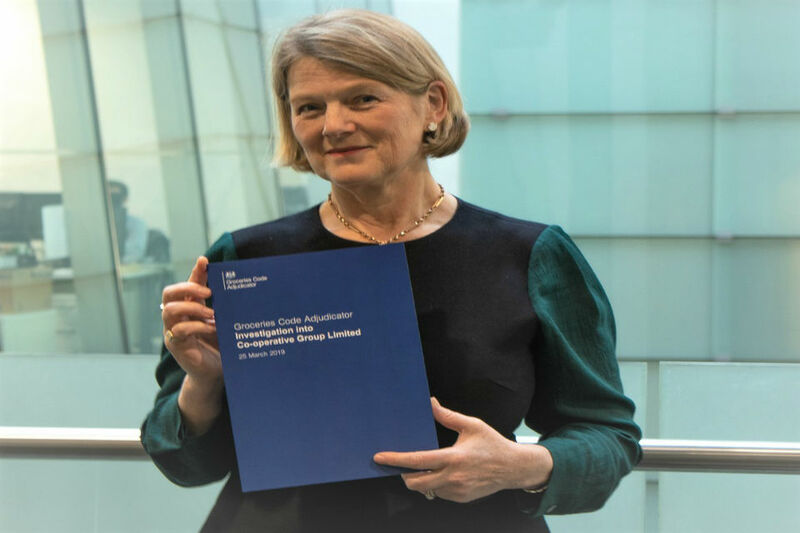 While the GCA has recognised that retailers have done a lot of work to tackle supplier concerns on this issue she is looking for more retailer progress. 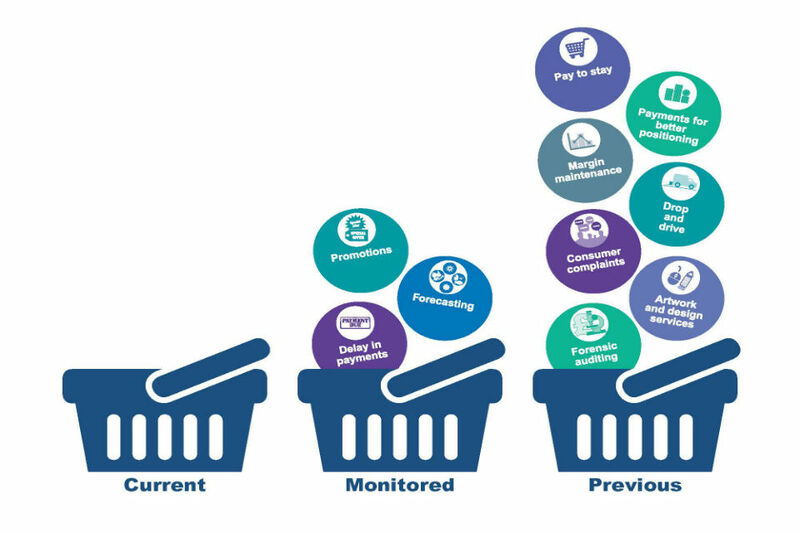 The GCA also asked retailers to report back on a number of points in relation to delay in payments, such as how they allow suppliers 30 days to challenge any proposed deduction. This information will be reviewed before deciding next steps. The GCA is working with the additional designated retailers on all Top Issues, whether in the monitored or previous category. If suppliers have any concerns on these issues or others, they should report these to the GCA directly or through the annual survey that is currently open. 8 April Natural & Organic Products Europe at ExCel, London. 2 pm Your chance to understand the Groceries Supply Code of Practice (the Code). In 45 minutes Christine will explain how the Code can benefit you as a supplier, when to speak up and the progress the GCA has secured so far. Afterwards Christine and the team will be walking the event floor. Have a look at the event programme. 10 April Farm Shop & Deli Show at the NEC, Birmingham. 9.30 am Take 30 minutes out of your day to come and listen to Christine’s presentation to understand your rights as a supplier and find out how the Code protects you. Afterwards Christine and the team will be walking the show floor. Review the show programme. 25 April GCA Webinar hosted by University of East Anglia. 2 pm Join Christine for a 45 minute presentation followed by a Q&A as she talks about her role as the Groceries Code Adjudicator and how she has brought change to the groceries sector and tackled deep-rooted systemic problems through her work with both retailers and suppliers. To join, please email Sophie Barnard at Sophie.Barnard@uea.ac.uk. 24 June GCA Annual Conference at Church House, London. 10 am Christine will present her annual report and her priorities for the coming 12 months. 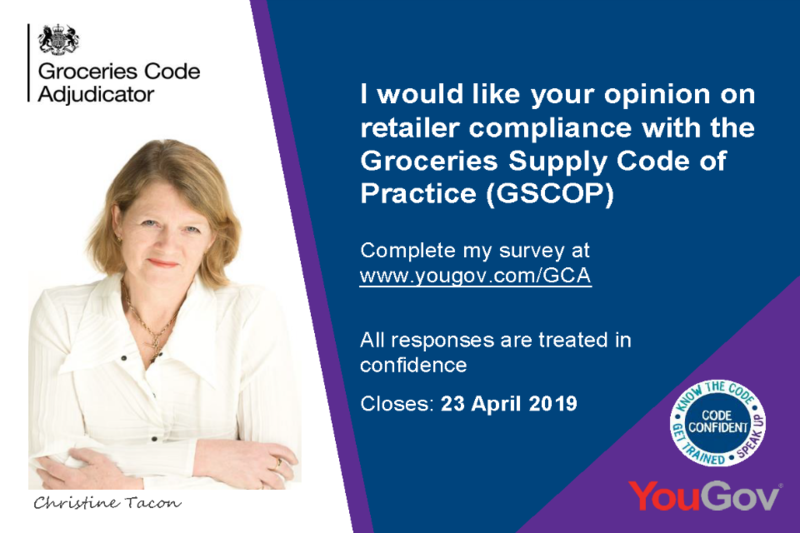 YouGov will announce the results of the GCA’s annual survey and Christine and a member of her team will be available for 1-2-1’s with direct suppliers. You can register for the conference now.